The resort is split into 4 areas. Disney Village, restaurants and hotels for light entertainment, meals and sleep. Golf Disneyland Popular with adult visitors, a Disney-themed golf course. 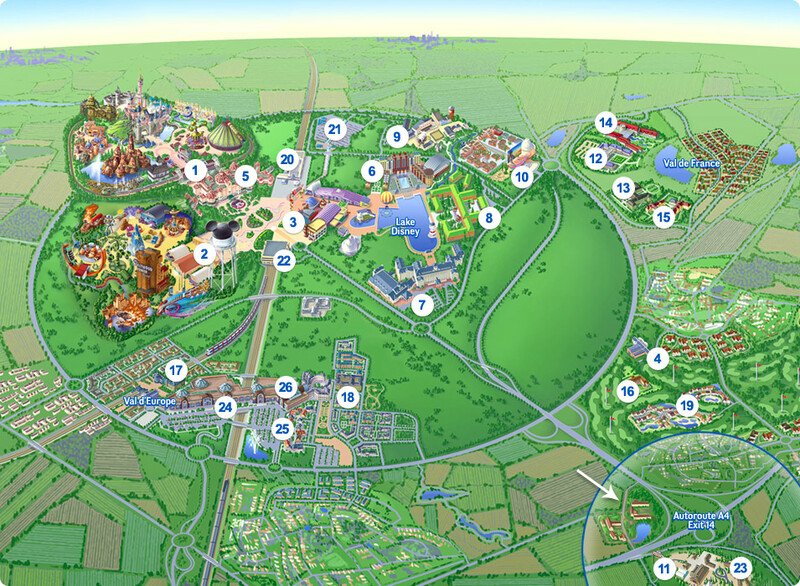 If travelling by Eurostar train, there is a direct station stop in the Disneyland Paris resort. You could also travel by rail to Val d'Europe the local shopping centre (Big one! ), also Sea Life Val d'Europe an underwater aquarium located minutes from Disneyland. Enjoy the highest quality and cheapest family holiday deals from Ebbsfleet International to Disneyland, Paris, France. Advertise in Disneyland Resort Paris? Trains travel directly from London via Kent to Disneyland Paris, France. A typical journey between Ebbsfleet and Disneyland Paris will take about 2 hrs 15 minutes. From Ebbsfleet International, changing trains at Calais-Frethun to Gare de Marne-la-Villee, will take just up to 4 hours. For an adult to travel from Ebbsfleet International to Gaure de Marne-la-Vallee is from just �69. The Disneyland Hotel is a hotel at Disneyland Paris. The hotel is located over the entrance of the Disneyland Park, it provides many rooms and public areas with a view of the park. Disney's Sequoia Lodge is on of many hotels situated at Disneyland Paris. Disney's Newport Bay Club is a hotel situated at the Disneyland Paris. The hotel itself is built in a crescent shape around one area of Lake Disney.